He was born in Ayia Varvara on 8/2/1953. Son of Costas and Kyriaki Ch. 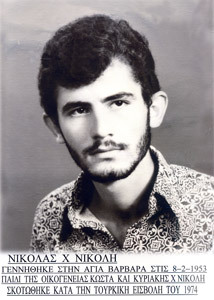 Nicoli. 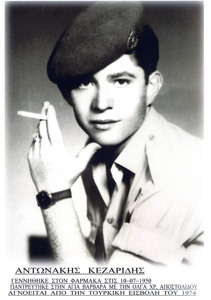 He was killed during the Turkish Invasion in 1974. He was born in Ayia Varvara on 12/4/1955. Son of Stauros and Theonitsa Spanou. 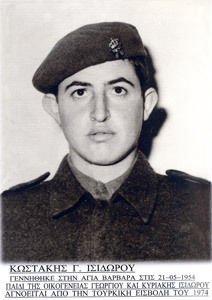 He was killed during the Turkish Invasion on 22/7/1974. He was born in Ayia Varvara on 6/1/1934. 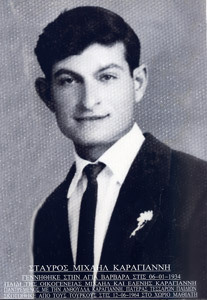 Son of Michael and Eleni Karayianni. He was married to Anthoula Karayianni and was the father of four children. 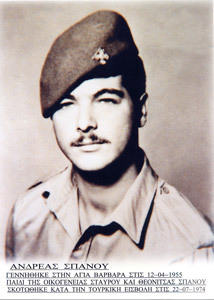 He was killed by Turks on 12/6/1974 in Mathiatis. He was born in Ayia Varvara on November 10th, 1950. His parents were Costas and Kyriaki Hadjinikoli. His remains were found in a group tomb in Kaminia, an area located somewhere in the middle of Dikomo and Sygchari and were identified using the DNA method. 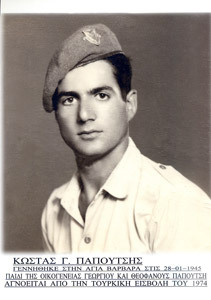 He received a hero’s burial in Ayia Varvara on May 14th, 2011. He was born in Ayia Varvara on 26/10/1954. Son of Pantelis and Kyriaki Kyriacou. He has been missing since the Turkish Invasion in 1974. He was born in Ayia Varvara on 21/05/1954. 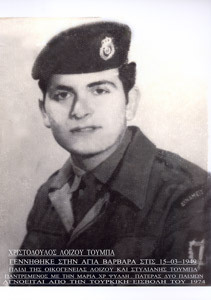 Son of Georgios and Kyriaki Isidorou. He has been missing since the Turkish Invasion in 1974. He was born in Agia Varvara on 10/07/1950. Married in Agia Varvara to Olga Chr. Apostolidou. He has been missing since the Turkish Invasion in 1974. He was born in Ayia Varvara on 28/01/1945. 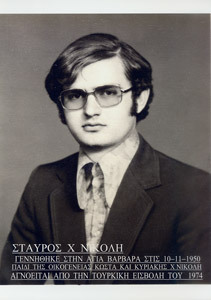 Son of Georgios and Theophano Papoutsi. He has been missing since the Turkish Invasion in 1974. He was born in Ayia Varvara on 15/03/1949. 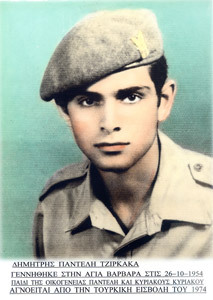 Son of Loizos and Styliani Toumba. Married to Maria Chr. Psilli. Father of two children. He has been missing since the Turkish Invasion in 1974. The unveiling ceremony of the heroes’ monument of Agia Varvara of Lefkosia and Choristi of Drama was held on September 6th 2010 in an emotional atmosphere. Present at the ceremony were the Metropolitan Bishop of Tamassos and Oreini Isaias on behalf of the Church, the Minister of Health Mr Christos Patsalides on behalf of the government, several members of the parliament, representatives of the Parliamentary political parties and of town and community councils. Also present at the ceremony were members of other authorities, various officials, while a delegation from the community of Choristi of Drama, which has been twinned with the community of Agia Varvara, also attended the event in the presence of several citizens. It was a modest and patriotic ceremony held to honour and glorify the immortal Freedom fighters, the heroes of the gallows, of the prisons, the ones who fell in the battlefield, the missing persons, the heroes of the road blocks, the silent fighters who protected this country, the youth whose dreams inspire and revive our hopes, the mighty ones. The ceremony began with a holy water blessing, wishes and a memorial conducted by the holy ministry. Metropolitan Bishop Isaias, during a short speech, praised the initiative taken by the twinned communities for holding this beautiful and special ceremony and among others underscored its importance, both for the two communities and the Greeks of Cyprus and Greece as well. It is people’s belief in Greek-Christian ideals that helps Greeks wherever they might be maintain their identity and provide hope for the future, the Bishop commented at the end of his short speech. The president of the community of Agia Varvara Mr. Marios Georgiou, whose work has been recognized by everybody through flattering words both for himself and the community, after thanking all those who contributed to this achievement, firstly saluted the heroes and missing persons and referred to each and every one of them individually by emphasizing their contribution towards our country, an invaluable contribution which can by no means be measured. “How and who can estimate the value of a young man’s sacrifice for freedom? Considering that these people, short in manpower, ammunition and means, but with great bravery, fought for their nation against the powerful British colonizers and the barbaric fully armored Turkish invaders, then there are no words adequate to describe their actions and contribution. We can only say that we owe it to them to be on alert and focused on principles and values that will lead us to a solution that will reunite our tortured Cyprus”, he concluded. The president of the Local Council of the Municipal District of Choristi in the Municipality of Drama Mrs. Tasoula Vasileiou referred to the fights of the Greeks against the Bulgarians and emphasised the brutality of the Bulgarians against not only the armed residents of her community but also against the unarmed women and children. The Bulgarians, in their effort to prevail over the Greeks, behaved in a cruel and inhumane way towards the peaceful inhabitants of her village. The victims of tortures, hard labour, deprivation and massacres, the martyrs of Choristi summed up to 700. Today, the day we honour our heroes, is a historic and emotional day since our twinned community is paying tribute to the victims of Choristi. “Historical memory is what “nurtures” the people of a country”, she stated with emphasis. For you, whose sacrifice is crowned with bays, your death is touted by history as an action of heroism. Glory is upon you and the bright sun is glowing. And Cyprus, devoutly dedicates this monument to you. In memory of the martyr village of Choristi of Drama against the Bulgarian occupation: 1912 – 1913, 1916 – 1918, 1941 – 1944. A similar park dedicated to the fighters of Cyprus was inaugurated in this Macedonian and heroic village in 2008. The presidents of the two communities referred to the bonds connecting their communities, the close relations that have developed between them, as well as to the mutual fights of the Greek nation for justice and freedom and promised that they would continue their cooperation hand in hand to ensure a better future. Health Minister Mr Patsalides, after congratulating the twinned communities for their strong relations, the positive results deriving from these and the messages they convey, referred to, among others, to history, which constitutes solid proof of the strong bonds between the residents of Cyprus and metropolitan Greece and the common fights given for survival. Next, he analysed the current situation referring to the evident and existing Turkish threat and the continuation, by breaking all International Laws, of the occupation of part of Cyprus by Turkish troops and shared some insight on how to deal with the dangers of imposing non acceptable solution plans on behalf of the Turkish side. The minister concluded his speech emphasising that expressing gratitude towards the heroes constitutes a distinctive attribute of our nation. The ceremony continued with a call in honour of the fallen and the bestowal of honorary inscriptions to the mothers, wives, brothers and relatives of those who fought to protect our country. This part of the ceremony was a ritual that touched everyone’s feelings. Many made a silent promise while others cried for the unfair loss of their beloved ones. The municipal choir of Dali sang patriotic songs and the ceremony ended with the National Anthem. In all respects, it was a successful event which boosted the struggling Greek people. The overall message deriving from all this is that with a spirit of cooperation and togetherness, with a high morale, faith in our goals while being focused on the institutions we have sworn to serve, it is our obligation to fully respond to the demands of our times and the expectations of our people no matter how much effort and labour we have to put in. Greeks never forget, never surrender but they fight until the end, until justice is served. All those who contributed to this event should be congratulated (community authority, teachers, artists etc.)! Honour and glory to the heroes of Agia Varvara of Lefkosia and Choristi of Drama, who fell while fighting for their country.